DOHA, Qatar _ Organizers have prepared 21 venues in the Qatar capital and its surrounds to host the 39 events of the 2006 Asian Games. 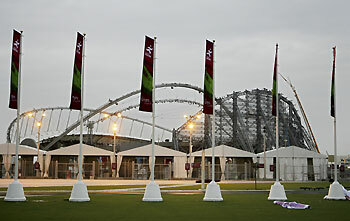 Central to the Games and its events is Doha's Sport City complex, which includes the redeveloped Khalifa Stadium, which will host the track and field events, as well as the opening and closing ceremonies. The Sport City, 8 kilometers (5 miles) west of Doha, is also home to the state-of-the-art ASPIRE Academy of Sports Excellence indoor complex. 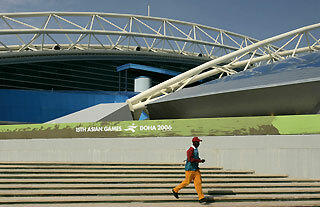 Originally opened in 1976, Khalifa Stadium underwent a major upgrade ahead of the Doha Asian Games. A new running track was installed in May, 2005, while seating capacity was expanded from 20,000 to 50,000. A new tensile fabric roof structure has been built over the western seating and a spectacular arch added to the east. With a span of 265 meters (290 yards), the arch uses gravity to create tension in its supporting stay cables in order to appear as if floating in mid-air. It will host the December 1 opening ceremonies and December 8-12 athletic events. The marathon, road cycling events and walk will be contested along the palm-lined Corniche waterfront in central Doha. The 7.5-kilometer (4.7-mile) Corniche starts at the Sheraton Hotel in the north and sweeps in a smooth curve to Doha's newly-built Museum of Islamic Arts. The stretch of waterfront offers views of the city skyline and is popular for picnicking in the nearby gardens. The ASPIRE indoor sports complex features seven halls that will host track cycling, gymnastics, badminton, wushu, kabaddi, wrestling and boxing events at the Doha Games. The 73,000-square meter venue designed by French architect Roger Taillibert is touted by Games organizers as the largest multipurpose indoor sports dome in the world. Part of the Sports City sporting facilities precinct, the venue also houses a 6,000-seat soccer stadium and Olympic-sized swimming and diving pools. Opened in November 2005, it is primarily used by the ASPIRE Sporting Academy which was launched in 2004. During the Asian Games, ASPIRE's indoor athletics stadium will host the artistic, rhythmic and trampoline gymnastics events, while a temporary velodrome has been built on the indoor soccer pitch for track cycling. The 2,000-seat Basketball Indoor Hall, commissioned in June 2004, is the only permanent, single sport venue at the Games. Located in the Sport City complex, adjacent to Khalifa Stadium, the purpose-built venue was one of the first venues to see action these Games when qualifying play kicked off November 23 to determine the final berths for the men's competition-proper, which starts November 30. The three story Hamad Aquatic Centre, host to the swimming, diving and synchronized swimming events, has undergone a significant facelift ahead of the Asian Games. 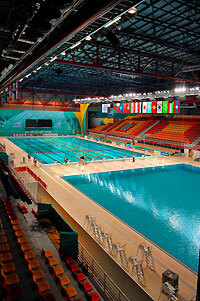 It features two Olympic-sized swimming pools and two diving pools The main pool area seats more than 2,000 spectators. The swimming events begin December 2, with diving from December 10. The open temporary venue at Sport City will host the beach volleyball, as well as the cross country portion of the equestrian three-day event. The open-access temporary venue can accommodate several thousand equestrian fans when the cross country event is held December 7. Seven courts have been built for the December 2-11 beach volleyball competition, including a center court with seating for 1,500 spectators.